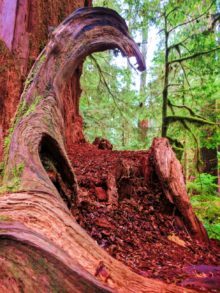 When you visit the Puget Sound area or more specifically the Olympic Peninsula, you’re bound to want to make a gazillion stops. We could tell you that every stop is awesome and worth your time, but we like to direct you to just the best stops. 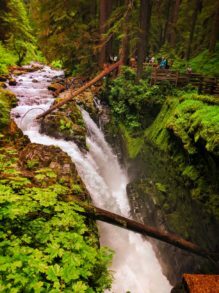 Sol Duc Falls in Olympic National Park is one of those spots that’s so gorgeous you need to make the time for it. 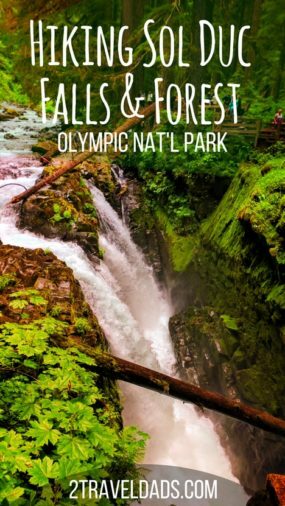 There are several waterfalls on the Olympic Peninsula that are breathtaking, but Sol Duc Falls is the ideal combination of rainforest and waterfalls. 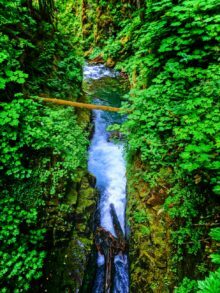 The level of green and lush you experience in the Sol Duc Falls area is mystical and magical. So here’s everything you need to know about visiting this mossy wonderland. 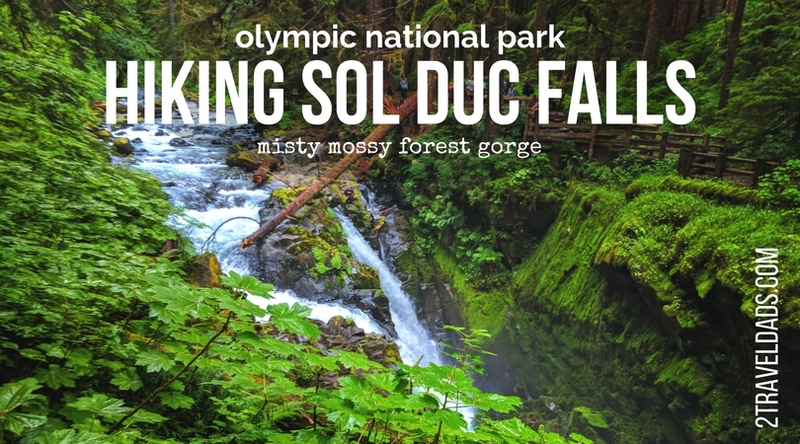 Sol Duc is located on the northern side of the Olympic Peninsula, just west of Port Angeles. It’s about three and a half hours driving from Seattle or an hour from Port Angeles (if you’re staying there or coming over from Victoria). It’s located off Highway 101 between Lake Crescent and the town of Forks (think Twilight). Olympic National Park has many entrance points, some monitored and some not. 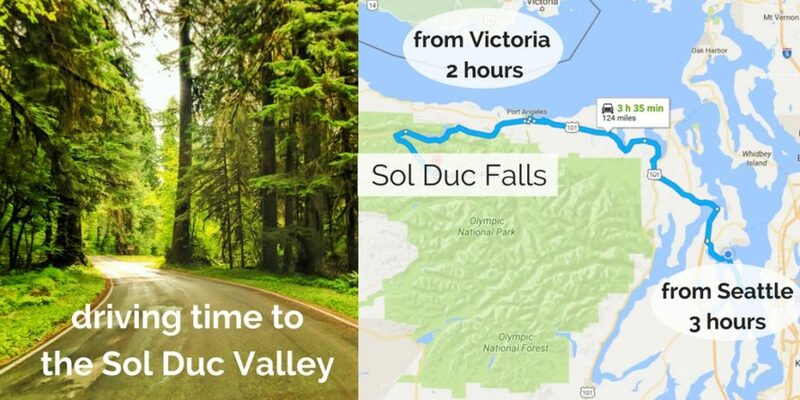 Sol Duc is one of those spots so you will need to have a National Parks Pass or purchase a day use pass at the entry gate. 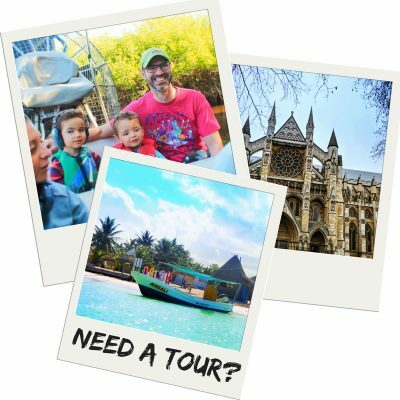 You might as well buy the annual pass because there are so many awesome National Parks you can visit and with day use costing about $25 USD per visit, you’ll make the cost back within four visits to the many parks. 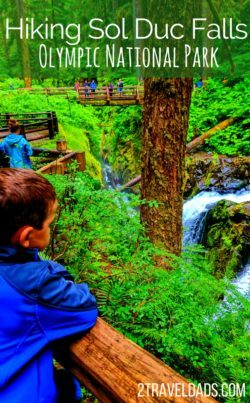 Depending on your overall plans on the Olympic Peninsula, Sol Duc Falls and the area can be just a day visit, but if you really want to dig into the forest and springs, then an overnight is good. 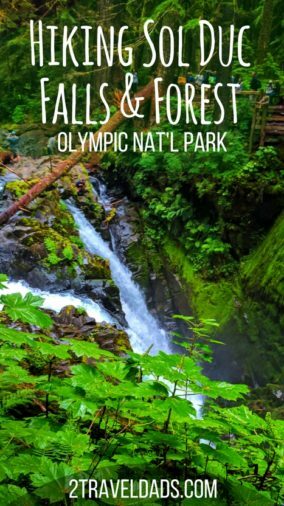 There is more to do than you think, but also, it’s one of the more rainy areas of Olympic National Park so you might not want to dedicate all your time to this one place. What a beautiful hike! 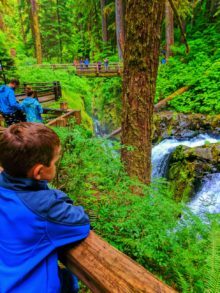 Here’s what we love about hiking to Sol Duc Falls. The trail leads through one of the more green, quiet forests we’ve visited. There are several footbridges from the start of the trail to the actual falls so there are lots of great photo ops. The plant life varies from old growth trees to nursery logs and delicate vine maples. Regarding how easy the trail to the falls is, it does start with a hardy descent and then levels out, and then there is very little elevation change for the rest of the hike to Sol Duc Falls. The trail is very rooty and the interesting individual sights to see along the hike are few and far between, but the finale at the end is one of a kind. 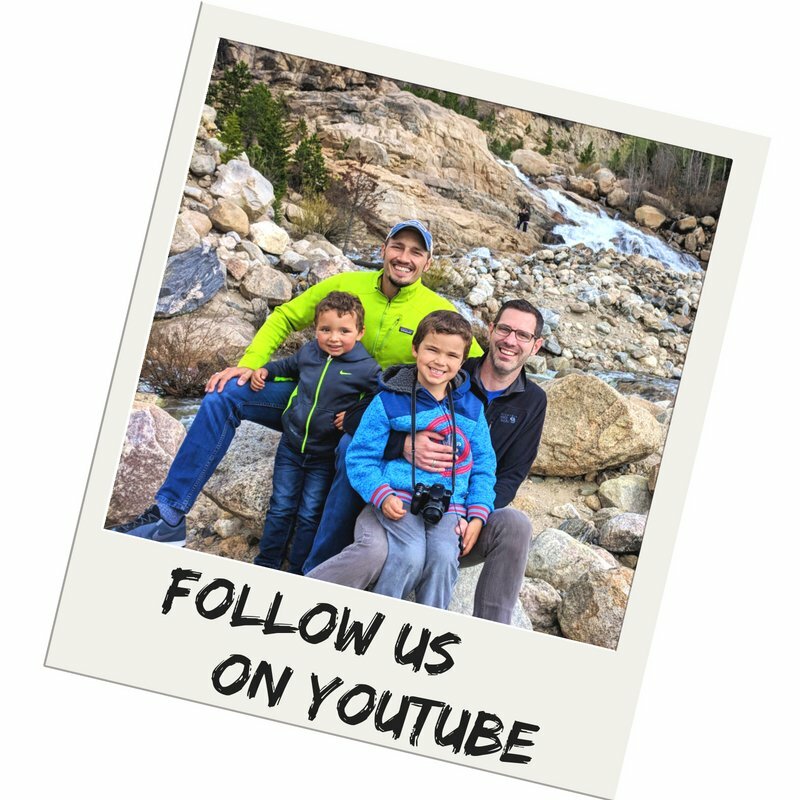 Note: really, this is a great hike with kids because even though there aren’t epic moments around every corner, it’s fun to count the creeks and check out the rotting layer of the forest the trail cuts through. 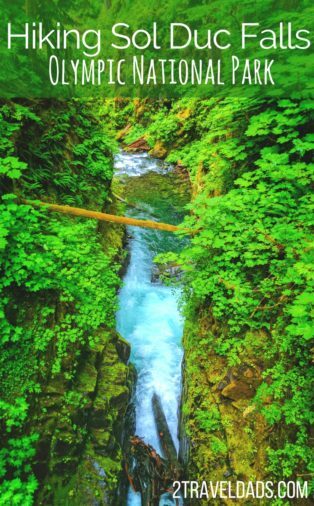 Sol Duc Falls itself is a double falls, separated by a narrow, churning gorge. The canyon walls are dripping with moss and mist. The forest all around the falls is dense and so very vibrant that you’ll swear you’re in an Irish fairytale of some sort. There are several viewpoints to check out the falls and some benches, even a rustic shelter, if you want to have a picnic. 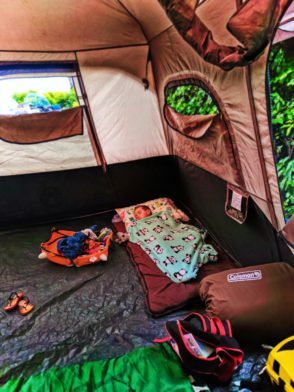 Kids and adults will love this hike. We saw hikers of all ages and skill levels on the trail, but in no way would we call this trail accessible for anybody using a stroller, wheelchair or other walking assistance. The trail itself is just too bumpy and unpredictable. 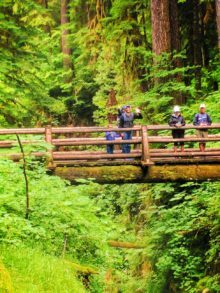 Just in case you’re planning a whole big visit on the Northern Olympic Peninsula, there are lots of other cool things to occupy your days. Sol Duc is most famous for its hot springs. 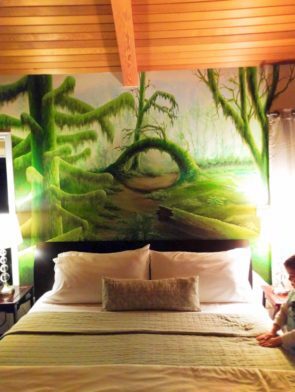 While they used to be just bubbling up and then you could dip in them, now they’re fully built into tubs and pools and are a part of the Sol Duc Hot Springs Resort. You can get just a day pass for the variety of mineral pools at the resort. You can even rent a towel if you aren’t prepared, so you might as well spend some time and go between the hot and cool pools. Tip: if you’re totally digging the hot springs idea, you can also visit Olympic Hot Springs which is in the Elwah area of the Park… but it’s a crazy 10 mile hike to the springs. The road washed out and has yet to be rebuilt. 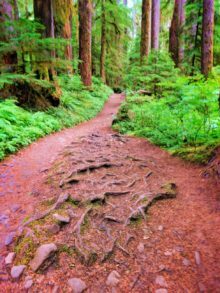 Also on the way up to Sol Duc Falls within the Olympic National Park boundary is the Grove of the Ancients trail loop (0.6 miles total). 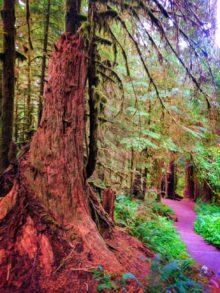 A much shorter hike, actually a nature trail, the Grove trail takes you through an old growth forest, similar to the Hoh Rainforest. It’s a great option to add to your day if you’re not planning on heading all of the way to the western side of the Park. Marymere Falls is a slightly longer hike at nearly two miles round trip and leaves from the Storm King Ranger Station just east of the Sol Duc entrance. The falls is very different from Sol Duc, so is a worthwhile stop. And you can’t forget about Hurricane Ridge in Port Angeles! Lake Crescent is the last nearby site we recommend. Lake Crescent is one of the most gorgeous lakes in Washington State. 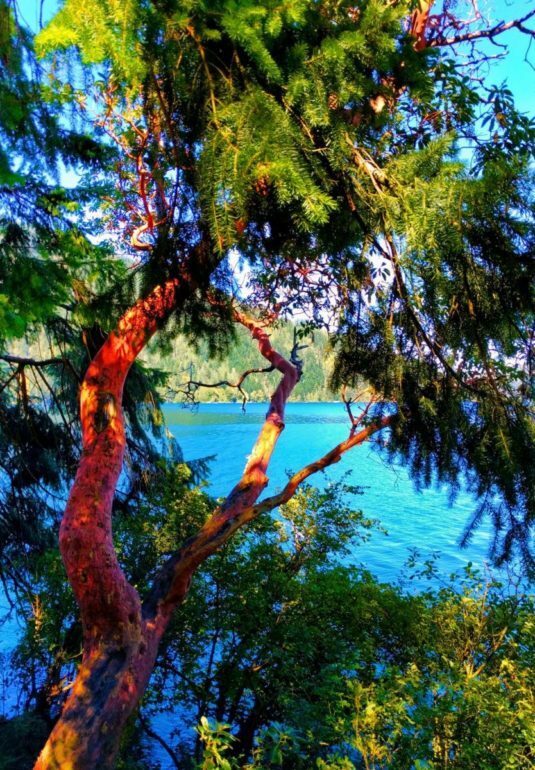 It’s a perfect turquoise blue and surrounded by madrona trees. 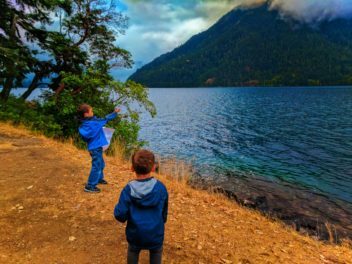 Activities on Lake Crescent include picnicking around the lake, hiking the surrounding hills and boating on the lake. Lake Crescent has kayak and rowboat rentals at the Lake Crescent Lodge, or there are boat launches if you’re bringing your own boat. Tip: for more ideas for getting on the water, check out our spots for kayaking in the Pacific Northwest. 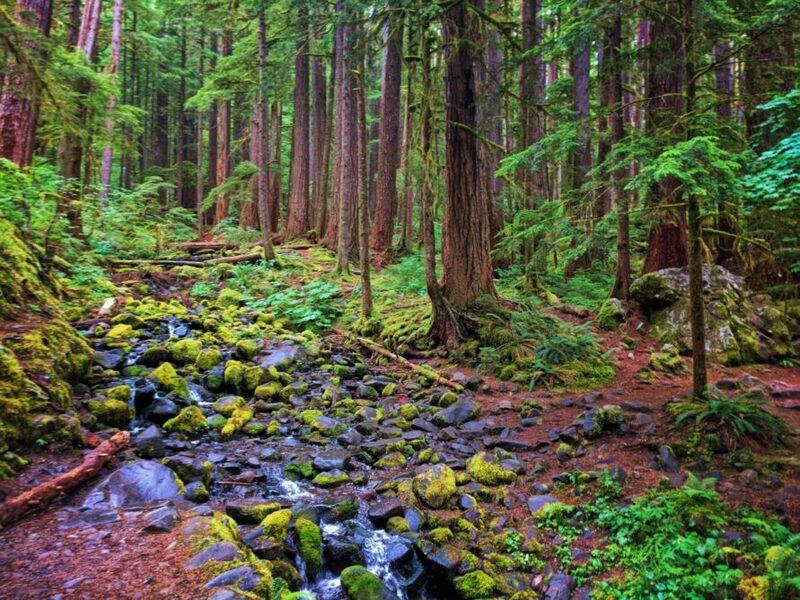 There is a campground at Sol Duc falls, nearly to the trail head, and it actually has its own spur trail connecting to the falls trail. That campground runs on a reservation system. 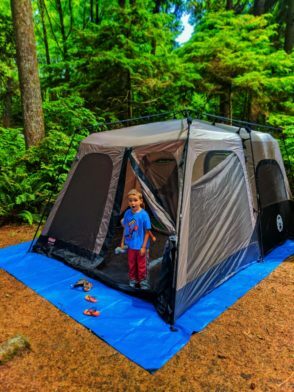 We haven’t camped here ourselves, but the impression from what we’ve seen of the campground is that it’s quite close quarters and most likely wouldn’t rank very high our our National Parks campgrounds list. And then right near the Sol Duc Falls trail is the Sol Duc Hot Springs Resort, which isn’t just the springs, but also a hotel. You can stay here and enjoy both the awesome hiking in the forest as well as the hot springs facility. And then there’s the Log Cabin Resort on Lake Crescent. The Log Cabin Resort and Lake Crescent Lodge are two other nearby, fun, rustic options for a weekend trip. 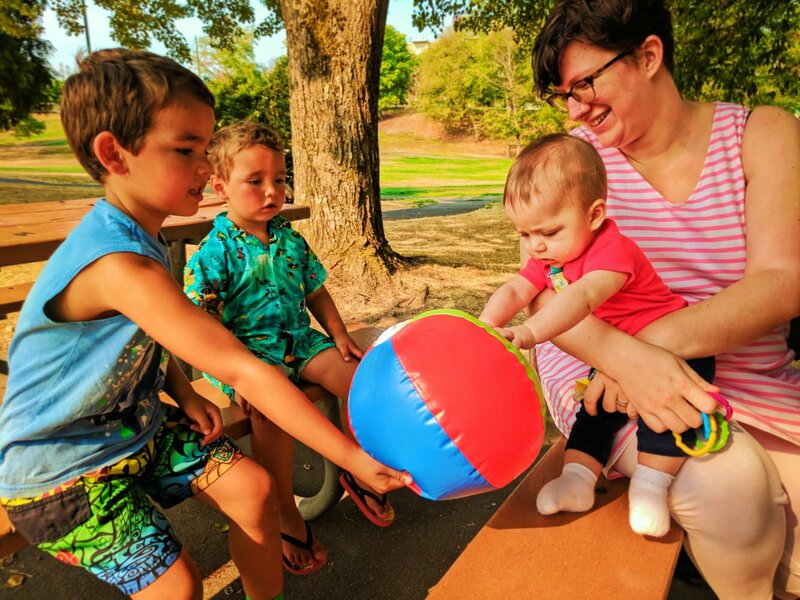 Both are located at Lake Crescent, which we mentioned above, so lots of fun. Tip: like with any accommodations ever, we kindly remind you to make reservations as far in advance as you’re able to. 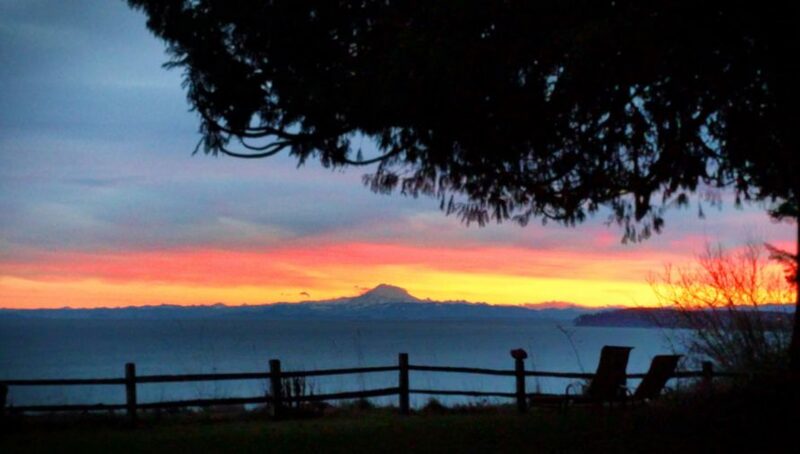 The Olympic Peninsula is a popular place and you don’t want to not get to stay. 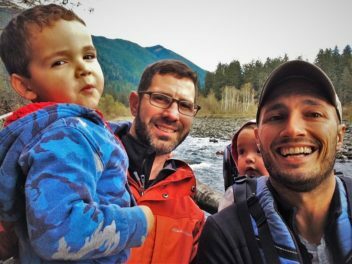 We really enjoy Sol Duc Falls and the other sites of the area. 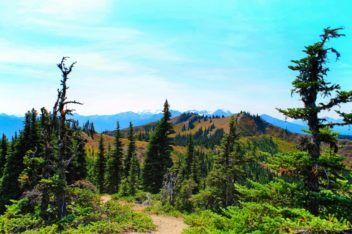 Even though it may not be the most well known of spots in Olympic National Park, it’s really worth the visit and makes for a great weekend visit or day trip. 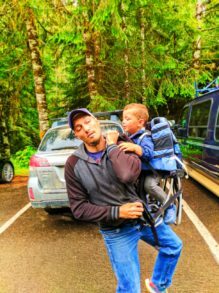 The hiking alone is worth it and the whole family will enjoy it! 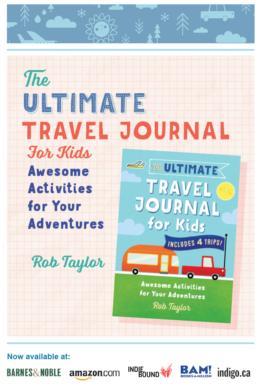 Want to pin this for your Pacific Northwest vacation planning? Go for it!